It's the end of chocolate - forever! 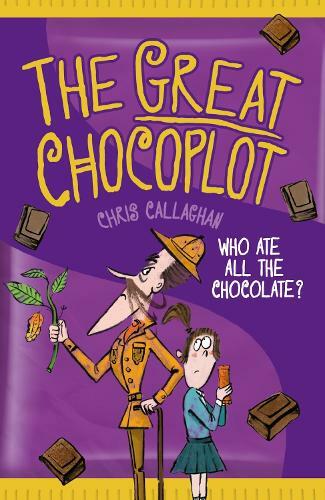 At least, until Jelly can solve the mystery of the great chocoplot ... 'With an excellent cast of characters, laugh-out-loud moments, and witty and sharp observations, this is a great choice for fans of Dahl and Walliams.' THE GUARDIAN Jelly and her family live in Chompton-on-de-Lyte, where everyone loves a Chocablocka bar or two. So when the end of chocolate is announced, she can't believe it. Determined to investigate, Jelly and her gran follow a trail of clues to a posh chocolate shop and its owner, the pompous Garibaldi Chocolati. Gari's suspiciously smug, despite his failing business and yucky chocolate. Is it really the chocopocalypse, or is there a chocoplot afoot? Chris Callaghan what are you doing? Scaring all your lovely readers with the thought of no more chocolate... this could cause us all to lose sleep! !